It was the 1950s. My grandmother, Edith Jackson, was shopping in downtown Elkhart, Indiana. As she passed a department store window, the display stopped her in her tracks. A lovely white woman was posing next to a brand-new washing machine. Next to this was a mechanized, fat black woman with a bandana on her head, reminiscent of Aunt Jemima, laboring over an old-fashioned washboard. This image incensed my grandmother. She marched right into the store, demanding to see the manager. 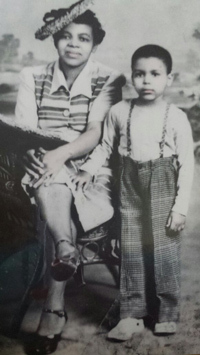 Understand that my grandmother was 4 feet 10 inches tall and weighed barely 100 pounds. She would not have intimidated anyone based on her stature. Moreover, people in an overwhelmingly white Midwestern city in conservative Indiana would have hardly felt pressed to comply with the demands of an African-American woman. And yet the store manager removed the display immediately. In response to the demands of my grandmother, he took the display down. and her father, Theodore Jackson. I never knew my grandmother. She died before I was born. But I heard this story many times growing up, and I realize now that this story -- and the retelling of it -- formed me as a leader. It influenced how I lead as an African-American woman, and it makes me sensitive to the fact that much of what many would consider the cultural fabric of my heritage was foundational in determining who I am as a leader. My realization stems from the power of story. History is often just that: his story -- the story of the victor. The most heralded lessons of leadership are not written by people who look like me. Much of what’s promoted as the pearls of leadership wisdom -- what we should do and how we should do it to be the most effective in our leadership -- are really the learnings from a Eurocentric, patriarchal experience. And in many instances, these learnings have served me well. I understand how to be an adaptive, emotionally intelligent, self-differentiated leader who is able to motivate diverse teams of individuals to engage and learn collectively so that the organization can make progress on confronting challenges. These are important capacities for leadership, but they don’t tell the whole story of who I am as a leader. You see, I am a product of African-American ancestry, two generations removed from slavery, descended from people who left the stain of segregation in the South to seek a better life and opportunity in the North. I was raised by parents who were the first in their generation to be college educated and who instilled in me the message that education was paramount to future success. Although I am decades from the South, my Southern roots are at times reflected in my ways of being and speaking. How have the capacities for leadership been harnessed and nurtured in me? How do I bring my full self to the leadership table? It is through the stories and narratives that have been passed from generation to generation. It is through the stories that were retold or overheard when I was a little girl sitting between my mother’s knees as she braided my hair. Stories told at the kitchen table when the old folks got together. These were the stories that the women told as they snapped beans, shelled peas or picked greens. The stories were often funny. But the wisdom, passion and assertion of personhood was not laughed away. Growing up and hearing the stories, I learned of the faith of patriarchs, the assertiveness of matriarchs, the joys and struggles of bygone days, the persistence of a people who continued to strive from then until now. In short, I found my voice and a sense of self through the stories. Just consider the story of my grandmother. What did I learn from her confrontation with the store manager? I learned of an indomitable spirit that would not be quenched. I learned of righteous indignation that would not back down. I learned of a fearless consciousness of justice. I was reminded of Jesus Christ, who stripped the mask from the oppressive powers of the day to demonstrate what was right, just and true. Most importantly, I learned that when these capacities are combined, not only could I lead, but I could lead in ways that made a difference. The result was an empowering affirmation of self that I believe is transformative for leaders now. Many of us realize that our experiences are not found or fully expounded upon in leadership theory. But I have come to recognize that as we unearth and retell the stories of our own cultural heritage, those stories can powerfully enhance who we are as leaders. I am a witness to this. Because of story, I found my voice, and I can authentically lead from my whole self.